Working with the Barion API is a no-brainer. The time required to integrate Barion can be as low as a few hours. Of course, the exact time required depends on your needs, your business expectations and several outside factors (system architecture, business process management and available resources). Most of the time, basic integration and testing are accomplished in a couple of days. Don't try to save time by jumping directly to sample code. We know developers like to hack (we do, too), but a payment system requires discipline, so we advise to read the docs thoroughly. 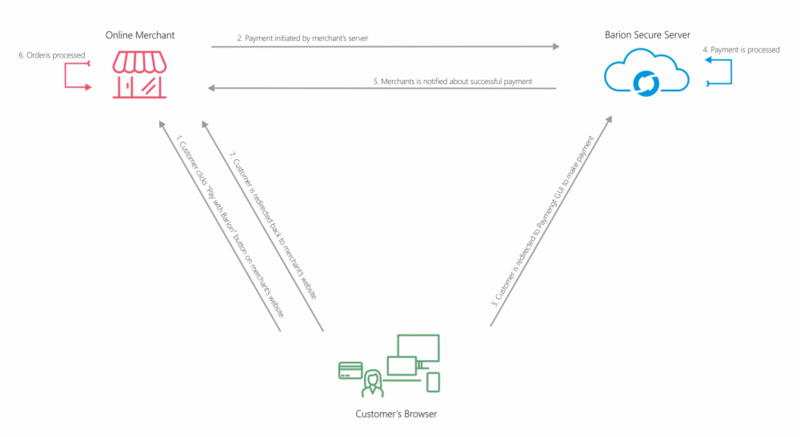 The merchant's server initiates the payment by calling the /Payment/Start API and using POSKey for authentication. Barion returns a Payment ID. Shop records the transaction. A responsive web user interface. If the customer has no Barion account, card data must be provided. If the customer has a Barion wallet (account), she logs in and may choose to pay using a card on file (or a new card) or alternatively from her Barion balance. In case of a change in the payment status (e.g. successful payment happened or the customer rejected the payment), the Barion server notifies the shop. Upon receiving the notification the shop must call /Payment/GetPaymentState to see if payment was successful or not. The merchant's server records the result of the transaction. The user is redirected by Barion to the merchant's return URL. Guest payment with card – available for any card holder with a card capable of making VPOS payments. The debit or credit card is charged and the merchant's Barion account is topped up with the equivalent amount. No need for Barion registration or previous top-up. 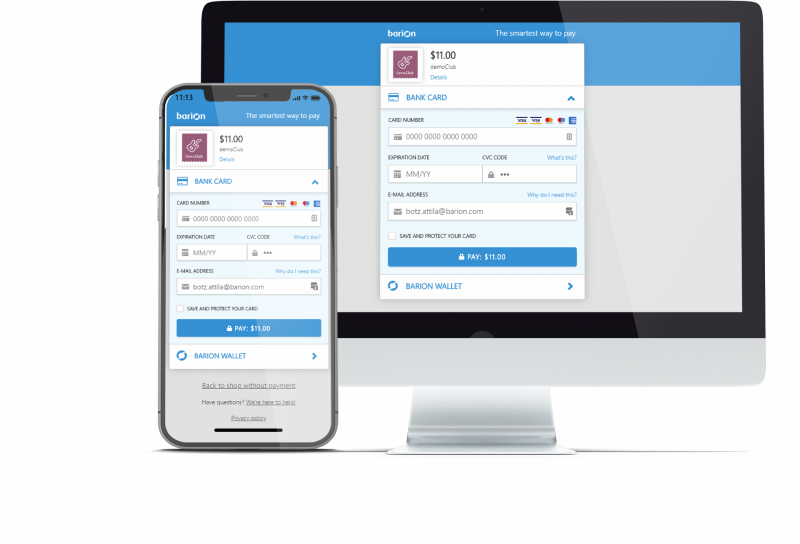 Payment with card on file – available for any card holder with a card capable of making VPOS payments that previously registered with Barion and chose to store card data in their Barion wallet. The debit or credit card is charged and the merchant's Barion account is topped up with the equivalent amount. Card data is stored in a PCI DSS compliant card vault. No CVC is stored. No need for previous top-up. Payment with prepaid Barion balance – available for any user that previously registered with Barion and has a balance in their Barion wallet. Money is transferred to the merchant's account. This payment does not involve cards. Customer wallets can be topped up via bank transfer. Top up – available for all Barion users from a bank account. By wiring funds to Barion with a personal top-up code in the comment, Barion balance is topped up in the appropriate currency. Withdrawal - available for all Barion users. Funds are transferred from a Barion wallet to any bank account via wire transfer. Barion maintains a clone of the live Barion secure Server as a sandbox or test server, where developers can experiment with their solutions. The sandbox works with "test" money instead of real, so there is no risk playing around. Sandbox is open, all you need is to register and start playing. Don't forget to read the documentation though. For more information on differences in the live and sandbox servers, read Setting up the Sandbox environment and testing payments. All you need is an intermediate level of web back-end development with the ability and tools to call a REST API. Although there are no specific competency or tool requirements, an up-to-date development environment and toolbox is essential. We balance compatibility and security when picking which latest technology to use. For more information read Calling the Barion API. 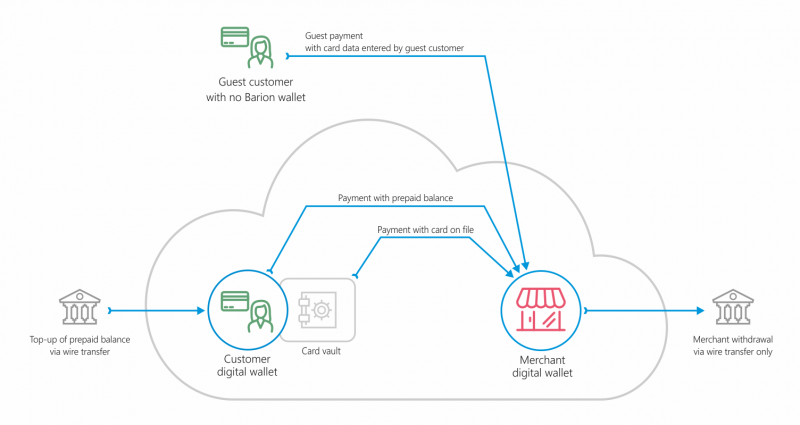 To use the Barion Smart Gateway and the Barion API in a given currency, you must have an active account with that currency. Barion servers use https:// protocol to communicate. We advice to use a REST library that can verify the identity of our server when calling the Barion API. Always use TLS1.2, as our support for earlier versions will be discontinued in 2017. For more information on differences in SSL certificates on the live and sandbox servers, read Setting up the Sandbox environment and testing payments. Barion is PCI DSS certified. Since you, as a merchant do not handle cardholder data, PCI DSS certification for merchants using Barion payment is not mandatory. The Payment Card Industry Data Security Standard (PCI DSS) is an information security standard for organizations that handle branded credit cards. If you handle credit cards, even if temporarily, PCI DSS certification is mandatory. For more information read Legal and accounting information. When your payment solution is working properly in the sandbox, you are ready to go live. Using the live server requires a real contract and an approved shop, so prepare in advance. Read the Going live guide thoroughly and follow the instructions before going live. Please follow the Barion Logo Guidelines and place the appropriate logo on your page. Our experience shows that it is important for customers to show they can pay with Barion on your web site. We also think that keeping the logo consistent across all Barion merchants helps the entire Barion community. Using the logo is a requirement for all Barion price packages, omitting it results in rejecting live shops. If you choose the Clever, Smart or Genius price package, you have to provide us with detailed cart content. Use the Item structure within the Items property of the PaymentTransaction structure of the Transactions property of the /Payment/Start API endpoint to pass data. The customers will see the cart content during payment and later in their Barion wallet history. Currently we do not allow placing the payment GUI in an <iframe> or similar solution, due to security reasons. This page was last edited on 12 January 2019, at 14:43.